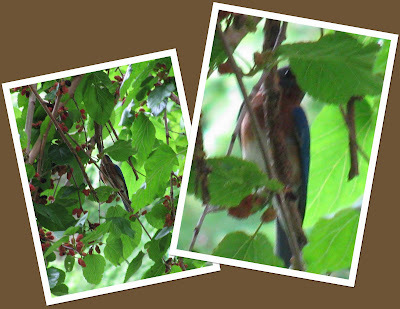 Our Wild Birds: Mulberry time! Things I Have Never Seen Before. So the pics are not great, but you need to know that I was pretty far below these guys, and sure, my camera has "Image Stabilization" but still... It was hard to get them zoomed in without losing them entirely in the leaves. ANYWAY.... Kent and I LOVE this Mulberry tree!! 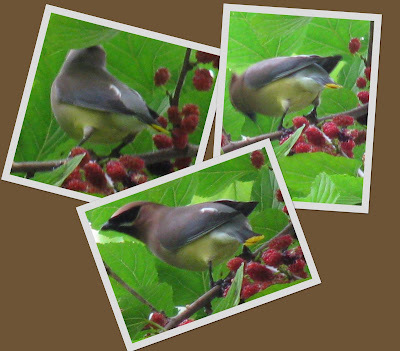 It brings us so many great visitors, and we are also able to harvest some fruits for ourselves - - Either for use on top of Yogurt or in the making of adult beverages - -Yummy! We first came into contact with a Mulberry tree when visiting Land Between The Lakes (LBL). We were hiking the Hematite Lake Trail, near the Nature Center, and came across this HUGE Mulberry tree. In that tree we counted more than 12 species partaking of the bounty. This, we thought, was something that we just HAD to have! That year we bought our own little Mulberry tree. We have not been disappointed either! and Papa Bluebird chowing down. It is my sincerest hope to catch more visitors in this hot spot - AND I don't have to drive all the way to LBL to enjoy the diversity of bird life... too cool.